We are apt to think of miracles as something unexpected, shocking and fascinating. But Da Vinci sees miracles in the simplicity of the natural world. This is the sign of a mystic – not someone who endeavours to escape the world, but someone who can see and feel the underlying beauty and unity of the world around us. In secret, Da Vinci cut open human bodies to discover the inner workings of the human body. But, dissection was only part of his understanding. He saw, through the myriad operations of life, how the ultimate goal was to evolve from separation back to unity. Da Vinci did not get caught up in the religious dogmas of the day. 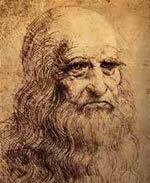 He rarely invoked God directly; to Da Vinci, his religion was the Truth. For seeking the truth would ultimately lead to the true understanding and the emotions of divine love and beauty. Yes, a true case of a person born almost as a realized soul.